I joined Pinterest a few weeks ago. The lovely Celine sent me an invite and now I’m completely hooked. I had heard about it months ago, but resisted joining for as long as possible. What I LOVE about it is that it is an easy and organized way of collecting inspiration and it automatically links back to your original source. Brilliant. 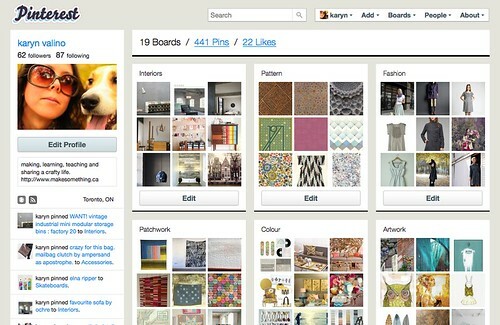 Take a peek at some of my boards on Pattern, Fashion, Interiors, Patchwork and Colour. You’ll notice a new button in my blog’s side bar that will take you directly to my Pinterest page when you need a little inspiration and eye candy. If you’re hooked on Pinterest too, let me know! Guilty pleasures are much better when shared with friends! This looks incredible. Can anyone join? I would love to. Oh my gosh, that site looks awesome! I love that all of one’s interests can be included. The boards are beautiful to look at. I’ve requested an invitation. I am really looking forward to participating. i think this is going to be a problem. there goes my morning! Fabulous. I would also like to join Pinterest. Is it possible ? I love using it as a visual crafty-to-do list! got an invite but don’t have a facebook account. says i need one. don’t want one but want to be on pinterest. so haven’t decided. but i love the site. i could look at it forever! I’ve been using it for awhile. I love the visual aspect – it’s just what I wanted for an inspiration board tool! I love this!!! How do we join?! Wow lots of yummy piccies, I like your crafty section 🙂 I just got a Tumblr account to save pictures I come across, have you tried Tumblr – any pros/cons in comparison? uh oh. Housework and dinner are out of the window! send me an invite to Pinterest! Sounds genius!! i love pinterest. and i spend way too much time on there. Please send me an invite!! I am in love with this and it would be so cool to organize all my faves! I am totally in love with Pinterest. I actually came across it because I noticed some of my photography and styling is on it. Sadly I don’t have an invite so I can’t share in the fun, although I am desperate too. Any tips on how to get an invite.